Last night was Stamp Club for Linda and I. She got to town and helped me sort some cardstock by color that I had gotten in a trade for stamps. I paid her for her hard labor with some awesome metallic and stardream cardstock. I think she thought it was worth it. She also brought me some mounting foam and now I can unmount a few more stamps that I need to get done. We went and ate at Applebee's, the 2 for $20, and Linda said we were in a rut because that is what we usually always order. I told her "well we are old enough that we have tried everything there is to try and now we can just enjoy what we like". We both thought that sounded good and ate our steaks with relish, well not relish, but relish like enjoyed *okie doesn't think steak would taste very good with relish*. We got to the scrapbook store early since we didn't have any other running around to do and they were having a huge 50% off sale on a bunch of great papers. We went through and started grabbing papers. I had a whole huge stack of paper and also picked up the Olive Pastel reinker I need for one of my cat eye inks. I kept waiting to get checked out and after two other people were checked out before me I decided I didn't need the paper after all and put it all back! I was so proud of myself for only getting the one thing I did NEED. When I told Linda she looked at me like I had lost my mind and couldn't believe I put it all back. I think she might have been jealous because I had some self control, I prefer to believe that instead of her thinking I am crazy. 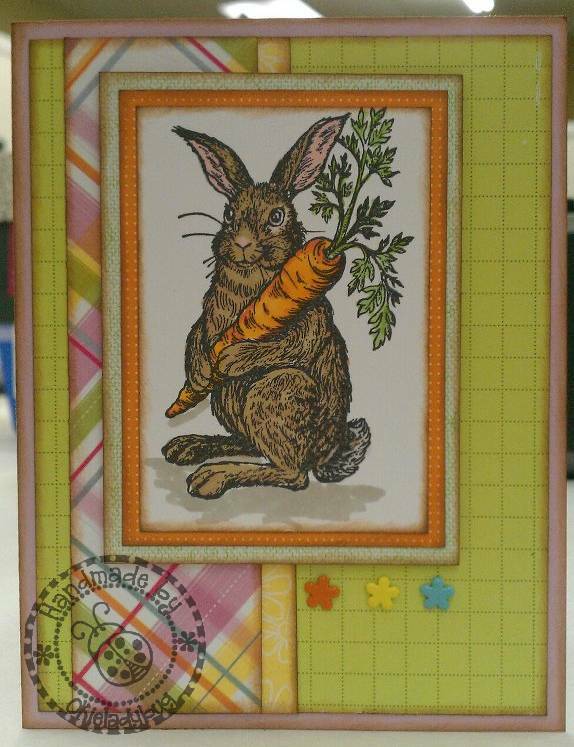 I had a few people ask how to use the ProMarkers so I went and stamped off a bunny holding a carrot and showed them how easy it was to do the coloring with the ProMarkers. 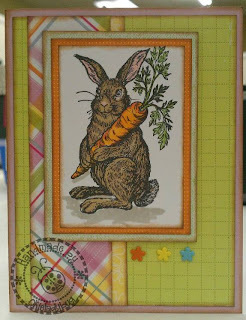 Since I had the bunny colored I thought it would make sense to go ahead and make at least one card, which is a lot more than I usually get done at Stamp Club! The image was super simple to color and took me about two minutes to do. I didn't have any papers with me so I just used the scraps that the leader of Stamp Club brings and I think it turned out pretty good for no pre-planning. I stamped "Happy Easter" on the inside and called it done. Blah, blah, blah,....we don't want to hear about stamp club, paper or dinner. WE WANT TO HEAR ABOUT YOUR IMPENDING NUPTIALS!! Who is this mystery man?? We're dying here Okie! Love your attitude about eating what you know you like. What a great way to look at it! I do the same thing you do when shopping - put a bunch of stuff in my cart, walk around the store looking at other things, then let my good sense take over and put it all back. Observers must think I'm weird. :-) I figure if I still want it after a few laps around the store, I'll get it. Sometimes I do, sometimes I don't. Happy hunting at Goodwill - love that store, too. Cute card!!! Good luck at the Goodwill. I love browsing for bargains. I go to the local one here about once a week. Love finding stuff for my studio. Have fun at your Goodwill store. I really like to go dig around in ours. We are lucky enough to have to, one on each side of town. You have convinced me that I need to invest in some promarkers. Wish me luck on my coloring adventure. Hope you had some good shopping at the new Goodwill, I always forget to go, but maybe Monday :) I love the story about Applebees, good saying, hope you don't mind I use it.